San Jose’s Firebird Youth Chinese Orchestra offers Chinese American youth a chance to learn to play the traditional instruments from their ancestral homeland. 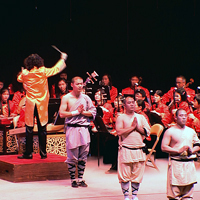 Spark joins the 100 member orchestra as they accompany the famed Shaolin monks to create a new composition. Next, follow environmental artist Daniel McCormick as he creates a new site-specific, temporary sculpture in the wilds of West Marin. 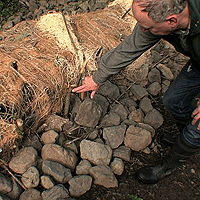 His biodegradable woven forms are helping to rehabilitate threatened watersheds and prevent creek bed erosion. Then, artist Jaime Guerrero translates imagery from his Mexican heritage into blown glass. Follow environmental artist Daniel McCormick as he creates temporary sculptures in the creek beds of West Marin. Meet Firebird Youth Chinese Orchestra's instructors and students who play traditional Chinese instruments. Turn up the heat with Jaime Guerrero at the Bay Area Glass Institute as he and his team create a feathered serpent -- out of glass.